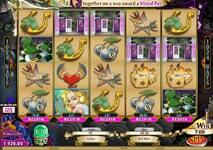 Online slots lure reel enthusiasts with the promise of scooping a huge payout with a single click on the Spin button. In fact, this is precisely the reason why slots are the single most popular type of game at online casinos – winning or losing on any given spin does not call for any skill, strategy or previous experience and anyone can potentially bag a nice prize as long as they line up a winning combination of matching symbols on the reels. While with slots winning depends entirely on luck, players who try a number of different titles will soon reach the conclusion not all slots are created equal and on some, winning combinations tend to hit more frequently. This all has to do with the average player return percentages of the games, which should be the number one criterion of all reel fans when they are picking which online slots to play for real money. In the following article, we will tackle the subject on RTP in brief and will provide slot fans with a list of five of the best paying online slots to bet on. With most casino games like blackjack, roulette and craps, the house edge, which is the built-in advantage the casino holds over players, is expressed in the payout ratio of winning bets. That is to say, the house practically charges players with a “fee” on all wagers they make, because winning bets are paid out on the basis of the casino odds, instead of being based on the true odds. In other words, there is a discrepancy between the probability of winning a given bet and the ratio you are paid out at, so that the house always ends up turning a profit in the long run, regardless of whether players are winning or losing. When it comes to slots, the house advantage correlates to the average return to player or RTP and is, in fact, built into the payout percentages of the games. The average player return denotes the amount of money the casino gives back to players per specific amount wagered on a given game, or in this case, slot. The player return is usually expressed in percentages and ranges between 88% and 99.9% for online slots. The higher the return percentage, the better for the slot player. For instance, the listed RTP of Playtech’s Desert Treasure slot stands at 97.05% which is to say players can expect to get back $97.05 on average out of every $100 they have wagered on this particular game, while the casino gets to retain the remaining $2.95. As the house edge of slots and their RTPs are closely related to one another, the tilt in favor of the casino can be easily calculated by subtracting the return percentage from 100%. In our example with Desert Treasure, the house advantage would be equal to 2.95%. This is not to say, a player will get back $97.05 each time they bet $100 on this game. While accurate, the RTP is distributed among hundreds of players spinning the reels of this particular slot. Hundreds of thousands of spins are required for the average return to even out to the specified percentage. Another thing to take into account when picking online slots to play for real money is their volatility, also known as variance. The term “volatility” is used to describe the amount of risk, inherent to a given online slot. If you have played online slots before, there is a good chance you have noticed that some games pay out on a regular basis, but the profits per spin are usually smaller. These slots fall into the low-volatility category, they are action-packed and are a viable alternative for players with a limited budget. Then again, you may have come across slots where payouts are few and far between, which is to say you tend to lose on spins more frequently than you actually win. However, when you do win, you typically win big, which is why such slots are considered the better option for reel fans, who have bigger bankrolls at their disposal and can afford to consistently lose until they finally recoup their losses with a hefty win. These are the high-volatility slots. Such games are by no means boring since they are packed with additional functionalities, lucrative symbols, free spins and bonus games. On the bright side, there are several factors which can help players determine the volatility of their slot of choice. For starters, you should check the paytable of your preferred slot to see how much the maximum amount you can win is. Slots with low volatility generally offer smaller jackpots. High-volatility slots, on the other hand, boast enormous jackpots but hit less frequently because otherwise, they will not be able to accumulate the amount of money, required to pay out on winning spins. Finally, it would be an excellent idea to check what the difference between the payouts for five and four matching symbols is. The greater the gap in the payouts, the higher the volatility of the slot. Unfortunately, online casino operators are often reluctant when it comes to sharing information on their slots’ volatility with players. This is not the case when it comes to RTP as all established operators provide up-to-date lists with the average return percentages of all slots in their gaming libraries. To spare you the efforts required to find the most lucrative online slots on your own, we have compiled a list containing five games which offer some of the highest return to player percentages out there. The slots in question are all courtesy of top-tier software suppliers the likes of Playtech, BetSoft and NetEnt. The RTP of all five suggestions exceeds 97%. The games are readily available at some of the most acclaimed online casinos in the industry so players can expect nothing but fairness and randomness when it comes to payouts. Traditionalists who enjoy betting on classic slots will greatly appreciate this fun 3-reel slot with 3 paylines, which is courtesy of industry frontrunner Playtech. The slot is rather simplified in terms of game controls but it would be fair to say simplicity only works to its advantage. The game features a feeble, old goblin who appears to rotate the three reels manually each time players press the Spin button. As far as betting limits are concerned, players can wager as little as $0.25 per payline while the upper limit is set to $15 per spin. The game is not as visually appealing as some advanced video slots, but this by no means should prevent you from giving the reels a few spins. Goblin’s Cave may be a classic slot but it comes with a nice twist since players will be able to benefit from some extra features such as the red ruby wild symbol and the lantern bonus symbol. One feature you are unlikely to see on modern 3D slots is the Hold functionality, which can spare you the exasperation of near misses. This feature allows players to keep one or more reels in place while the others are spinning, which increases their chances of forming a winning combination. The RTP of Goblin’s Cave is set to 99.32%, which is way above the average. Ugga Bugga is yet another Playtech creation that impresses with a sleek design, a tribal theme, and an exceptionally high return of 99.07%. This is a traditional slot with three reels and 10 paylines to bet on. However, as soon as Ugga Bugga loads, players will immediately notice the game does not quite look like a classic slot. The graphics are colorful and enhanced, but the game also has some interesting features to offer. These include the Golden Mask wild which can substitute for all other symbols on the reels with the exception of the scatters. Players can also keep some of the reels in place on subsequent spins thanks to the Hold functionality. The highest prize you can win on Ugga Bugga amounts to 1,000 coins and is awarded to the player, who lands three Golden Masks on one of the paylines. Vampires are a recurrent trend in popular culture and software developers at NetEnt have obviously taken a notice of this fact. 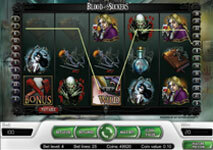 This slot, with 25 adjustable paylines, has been inspired precisely by the vampire craze. Being a 5-reel video slot, the game is more advanced when it comes to graphics, audio effects, and special features. Some of the symbols to make an appearance on the reels include cloves of garlic, a bible with a cross, crossbows, and a vampire bride, among others. There is the option to play on a budget since the minimum amount you can wager per spin is $0.25, that is if all 25 paylines are activated. More daring players can bet the maximum amount of $50.00 per round. Three bonus symbols with bloody clubs and hammers can unlock a blood-chilling bonus game, which involves players opening coffins and slaying the vampires sleeping inside. Each coffin contains a different cash prize, so once you unlock the bonus game, you are guaranteed to end your betting session richer than you were when you started. With an RTP of 98.00%, Blood Suckers is an absolute must for all slot fans. If vibrant 3D slots suit your individual preferences the most, you definitely do not want to miss this 5-reel slot with 15 adjustable paylines, which is among the most popular titles in the slot collection of software supplier BetSoft. What further contributes to the massive popularity of the game is the progressive jackpot it comes with. The game allows for a greater interaction since slot fans get to choose between Good mode and Bad Mode, although playing both modes simultaneously is also an option. Interestingly, players are rewarded with different special features, depending on which girl they choose to side with, the good or the bad one. There is a click-me type of bonus game with gift boxes, which is activated whenever the pitchfork and the halo symbols appear on adjacent reels side by side. The bonus games are slightly different depending on the mode you play in. Either way, you are guaranteed to collect a monetary prize in the end, with the three options being Small, Medium and Big Win. Other interesting functionalities the slot incorporates include wilds, the Money Wheel Bonus and the Double Up Bonus features. You definitely do not want to miss this game, not only because of its exceptional quality but because of its satisfactory RTP of 97.79%. Players who want their future predicted should definitely pay a visit to lovely gypsy fortune teller Rose, who is the character this exquisite BetSoft creation is based on. Being part of the software supplier’s 3D collection, Gypsy Rose stands out with colorful, bright graphics and superior animations which are nothing short of perfect. 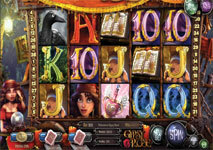 In fact, this 5-reel slot with 30 adjustable paylines resembles an animated film as far as visuals are concerned. The “magic” symbols are among the most lucrative features of the game. There are four of those, the love potion, the crow, the book of incantations and gypsy Rose herself, and each one can potentially earn players a different reward, including free spins, re-spins, instant wins, and bonus rounds. In order for this to happen, players are required to land the crystal ball symbol on an active payline on the third reel and then line up one of the four magic symbols on the adjacent second and fourth reels. During the bonus game, players are presented with 15 cards to choose from and beneath these, there are 5 different figure cards, in red, green or blue. Each color corresponds to a different multiplier on bonus winnings. Gypsy Rose is definitely worth your while as it comes with an RTP of 97.60%. 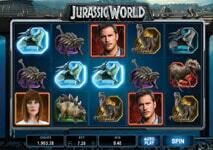 Jurassic World ranks among one of the most well-liked slot titles that are inspired by the all-time classic movie Jurassic Park. Developed by one of the giants in the iGaming world Microgaming, the slot comes with 5 reels and offers 243 ways to win. What sets the game apart from the other slot titles are its stunning animations. Even though the backdrop is dark and gloomy, together with the symbols, they will help you fully immerse yourself in the world of dinosaurs. One of the things that make the slot title so appealing is that gambling aficionados can trigger three different free-spins features when they land three or more Mosquito Yellow Rock symbols. The features players are presented with include Gyrosphere Valley, Creation Lab, and Raptor Den, and each of them will grant you 10 free spins. Apart from the free spins, the Gyrosphere Valley also comes with a multiplier that is applied when your bet was not a winning one. If you trigger the Creation Lab, you will be presented with Cryo Wilds and Rolling Reels. The latter will replace winning symbols, thus allowing you to enjoy several consecutive wins. As far as Cryo Wilds are concerned, they will remain where they have landed for 3 spins. 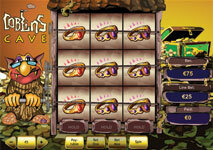 Raptor Dan comes with wild scatters that will remain on the reels until you get more free spins. Thus, if you land at least 3 scatter symbols, you will get 5 more free spins. The Indominus Feature is also designed to boost your winnings. It is unlocked when an Indominus Rex appears and you can have your total bet increased up to 1,000x. 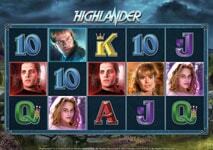 Highlander also lists among Microgaming’s most beloved slot titles. When creating the title, the provider was inspired by the popular movie Highlander, which tells the story of an immortal swordsman. The game features 5 reels and gives you the chance to bag some nice prizes in 243 different ways. The symbols include several characters from the movie and the backdrop also corresponds with the theme as the game is set against a rocky highland. What makes Highlander so alluring is that it gives slot lovers several options to sweep a prize. One of the ways to achieve this goal is to land three wild symbols on an active payline as thus, you will be able to form a winning combination much easier. The winning opportunities do not end here as players can also get 10 free spins as long as they manage to land 3 or more scatter symbols. Still, if you land 2 scatter symbols, you will unlock the scatter feature and the scatter symbols you have managed to collect will turn wild. Yet, it is important to note that this can happen only during the main game. Quickening Wilds is yet another of Highlander’s special features. Thanks to it, each time when you set the reels into motion, a lightning can strike. If this happens, the symbols that were struck by the lightning will become wild. The best thing about this feature is that when it is triggered, the number of the wild symbols will increase, thus giving you better chances to form a winning combination. 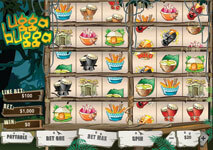 Tarzan falls into the category of some of Microgaming’s most recognized and favored slot titles. As you can probably guess, the inspiration behind the game is Edgar Burroughs’ book. When you load the game, you will notice that Tarzan himself is standing right next to the reels that are set against a jungle background. The title comes with 5 reels and 40 paylines and it promises a lot of fun and prizes. Tarzan will definitely grab your attention thanks to its amazing animations that are more than simply easy on the eyes. One of the main reasons why Tarzan enjoys such an overwhelming popularity is that the slot title is packed with special symbols and it gives plenty of winning opportunities. The Tarzan logo has assumed the role of a wild symbol and it can substitute all other symbols with the exception of the scatter ones. When it comes to the scatter symbol, however, it is represented by a bonus wheel. If you manage to land three or more scatter symbols, you will unlock the bonus wheel that can bring you several irresistible prizes that include free spins, cash prizes, pick-a-potamus bonus, and a jackpot that can multiply your total bet up to 1,000x. Players can get up to 12 free spins during which they will enjoy rolling reels that can bring them several successive wins and growing wilds that will increase the stacks by one each time they place a bet. In the event that you have been awarded a Pick-a-potamus bonus, you will be presented with 12 hippos to choose between and each of them can bring you a specific cash prize. NetEnt’s slot Hotline is a video slot that will take you back to the 80s and the theme will remind you of the popular TV series Miami Vice. The animations feature an impeccable quality and will make you enjoy every spin of the reels. The slot title comes with 5 reels and 30 fixed paylines and it is set against a street in Miami. While playing this slot, you can definitely pocket several amazing prizes thanks to its additional features. Hotline Bet is one of the special features of the slot and it gives you the chance to win re-spins and expanding wilds if you place a higher bet. As you will notice, each of the three rows is a hotline that can be activated and deactivated. Thus, if you activate all the hotlines, you will have a higher chance to win the aforementioned prizes. Additionally, if a wild symbol appears on any of the activated rows, it will automatically cover the entire reel. What is more, the wild symbol and the expanding wild will bring you the highest possible payout. In addition to this, if a wild symbol lands on one of the activated hotlines, you will also be awarded re-spins and the expanding wild will remain where it has landed until the end of the re-spins. While playing Hotline gamblers can also trigger the free spins feature. This will happen as long as you get 3 scatter symbols on reels 1, 3, or 5. Still, it is worth noting that you cannot win more free spins when a free-spins session has commenced. Immortal Romance is yet another of Microgaming’s most well-liked video slots and it will take you to the uncanny world of witches and vampires. You will definitely be intrigued by the game if you prefer titles with stunning and vivid graphics. Immortal Romance has 5 reels and will enable you to win in 243 ways. Despite the fact that the background is dark, it still has a certain appeal that may grab your attention. Slot lovers are given the opportunity to benefit from a number of bonus features. Wild Desire is one of the special features players can trigger at random. If you manage to do so, all reels will automatically turn wild. Chamber of Wilds is yet another special feature you can unlock as long as you get 3 or more scatter symbols. Amber will bring you 10 free spins, a 5x multiplier of your winnings, and the chance to retrigger the game. Troy will grant you 15 free spins and the vampire beast feature that can give you a 2x or 3x multiplier. Michael will give you 20 free spins and rolling reels that can bring you several successive wins, and a multiplier of up to 5x. Sarah will award you 25 free spins with the wild vine feature that can transform symbols in a way so that they could replace other symbols. The Phantom of the Opera is a feature-rich, 5-reel video slot from Microgaming which has 243 ways to win in a fantastic structure where winning combinations are formed by three or more consecutive symbols of the same kind. Inspired by the famous musical by Andrew Lloyd Webber, the slot is actually based on the magnificent 2004 screen adaptation of the same name. The game allows up to 25 coins to be wagered in denominations of either $0.01 or $0.02 and the maximum bet reaches $15 per spin. Players can enjoy a relatively high RTP of 96.40%, as well as double stacked Wilds, free spins, and bonus games. Let’s start with the Wild symbols – these are the logo of the game and they can be stacked in the base game. Another special symbol is the Phantom’s Letter image, which appears on the fifth reel and awards a cash prize of up to 20x the total bet. The Chandelier Bonus feature is also quite exciting as it triggers randomly and can turn up to 3 reels wild. One of the best symbols in The Phantom of the Opera slot, however, is the Scatter, which is represented as a mask. When 3 or more masks appear anywhere on the reels, they activate the Bonus Selection. Players can choose from the Music of the Night 10 Free Spins, the three-level pick-me style Masquerade Bonus game, or the All I Ask of You 10 Free Spins. 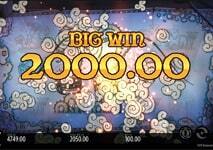 The Chinese themed 5-reel, 243-ways-to-win video slot Lucky Little Gods is one of the latest releases from Microgaming and it is certainly one of the most exciting titles to premiere in 2018. The game is clearly inspired by the Chinese New Year, with symbols such as firecrackers, golden trees, and treasure pots, but its visuals were beautifully designed in the popular manga style. Whether you have a deep fascination for the Orient or not, you would certainly enjoy this slot. With its cartoon characters, bright colors and serene settings – the reels are transparent and the symbols float in the clouds, this game is a true delight. Just as its name suggests, Lucky Little Gods is all about four Chinese gods who can bring you great fortunes if you are lucky. The 243 ways to win guarantee even more excitement – if you are not familiar with this term, it is used for the way wins which replace the standard pay lines. Instead, way wins are awarded for all adjacent symbol combinations that appear from left to right. But that is not all – when the Golden Tree Scatter and the Treasure Pot Scatter land on reels 1,5 or 3, they activate their respective bonuses with prizes of 1x to 100x your total bet on a single spin. On non-winning spins, you can trigger the Little Gods Bonus for up to 40x prizes. The Scatter symbol is represented as a firecrackers image and it activates 8 free spins when 3 or more Scatters land anywhere on the reels. The logo of the game is the Wild, on the other hand. Players can bet up to 10 coins in denominations from $0.30 to $30 for a maximum total bet of $300 per spin. Note that this is a relatively high-volatility slot with an RTP of 96.75%, which is why you may need to spend a little more time cracking the big wins. 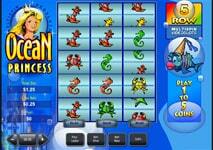 Koi Princess is lovely, Asian-inspired video slot with 5 reels and 20 fixed lines. It was created by NetEnt and released in 2015 and although it is not a brand new game, it is certainly one of the most feature-packed slots by the studio. It is also one of the very few slot games that are designed in the Japanese anime style. The princess character is accompanying players throughout their play and grants them tons of random features. Before that, players have the option to activate the Bonus Bet, which increases the probability of the random features. It doubles the cost of every spin, however. A total of four random features can trigger during each spin – the 5-Hit free spin, the Random Wilds free spin, the Wild Reels free spin, or Bonus Game activation. There are, in fact, four different Bonus Features, that are also activated when three Dragon Bonus symbols appear on reels 1, 3, and 5. Two of the features include the Sure Win Free Spins and the Wild Reels Free Spins, where players receive 10 free spins. The Coin Win Bonus Feature awards a cash prize, while the Bonus Wheel may award free spins, coin wins, as well as jackpot wins. Before starting to play Koi Princess, players need to choose the size of their bet. They can bet up to 10 coins in denominations from $0.01 to $1, but the 20 pay lines are fixed and are always active. The maximum bet is, therefore, $200 per spin. The RTP of this game is 96.00% and the volatility is medium, so it should appeal to most slot fans. 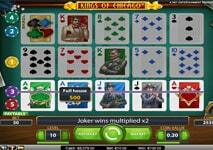 Kings of Chicago is a slot that will appeal to fans of poker. Instead of spinning reels, in this NetEnt slot, there are playing cards dealt on a poker table. Even though there is no spinning action per se, there are 5 reels where winning poker hands can be formed. The RTP of Kings of Chicago is estimated to 97.8% which is a pretty solid percentage of possible wins. Among the symbols of the game, you will notice the standard playing cards, including the Joker, playing the role of a Wild which can substitute any other symbol. There is also the Scatter which can randomly appear on any card on the reels. Look out for poker winning hands anywhere across the 5 paylines of the game as they will bring you the best payouts. The highest-paying hand is Natural royal flush and if there is a Joker in any of the winning combinations, you will enjoy double the payout. There is a special feature that can be triggered when you land 3 or more cards with the Scatter symbol on them. If you have three, four or five Scatters anywhere on the reels, you will be granted free deals, as the game refers to free spins. Landing 3 Scatters will reward you with 10 free deals, the number will increase to 15 if you land 4 Scatters. Lastly, 5 Scatters will trigger 30 free deals. While this bonus feature is active, any winnings will be multiplied 2 times. If you happen to land 3 or more Scatters while playing with free deals, the bonus feature will be re-triggered. Jungle Jim El Dorado is the perfect video slot for adventurous players. Follow Jungle Jim in his journey to the treasures of El Dorado and enjoy a fun and lucrative spinning. Thanks to this 5-reel, 25-payline slot by Microgaming, you can rack up pretty impressive wins while having an enormous amount of fun. While the game’s theme and graphics are very enticing, the high RTP of 96.31% is also a good reason to give this video slot a try. The developers of the game have picked a treasure chest as the highest-paying symbol. Among the other high-value items, you will see a totem pole, an Aztec mask, gems in various clours and a blue serpent. There is also a Wild symbol with the Jungle Jim logo. It plays the role of a substitute for other symbols except for the Scatter. One of the best and most intriguing features of the games is the Rolling Reels one. This option can be triggered both in the base game and while playing bonus rounds. Whenever you land a winning combination, the symbols that have comprised the combo will disappear from the reels and will be replaced with other symbols. This way new winning combinations can be formed over and over and the multiplier of winnings can reach up to 5x. While playing Jungle Jim El Dorado, there is also the possibility of triggering the Free Spins feature. It will allow you to play ten free-spin rounds and even re-trigger the bonus round. While playing with free spins, the Rolling Reels multiplier can reach 3x, 6x, 9x, 12x and 15x which may bring players wonderful payouts. If you love getting tattoos, you find tattoo artist interesting or you simply are looking for an innovative and fun slot, Hot Ink will definitely appeal to you. Microgaming allows players to spin the reels of this 5-reel video slot and possibly hit one of the 1024 ways to win the game. The symbols of the game include different tattoo artists, various tattoos of items considered stamps of good luck, as well as a tattoo shop. In addition to the cool theme and graphics that Hot Ink can offer, the game has also a quite high RTP of 97.5%. This ranks the game as one of the highest paying slots which are very tempting for fans of spinning adventures. You will notice two different female tattoo artists as symbols of Hot Ink. Each of them will reward 750 coins if they appear on all 5 reels. If the two attractive tattoo artists appear in a combination at all 5 reels, you will enjoy a mixed pay of 500 coins. The special feature about Hot Ink is the option to respin single reels. If you are one symbol away from a winning combination, you can place your bet on the reel of your choice and respin it. There is no limit about the times you can respin a single reel. If you are lucky enough to land three, four or five Tattoo Bonus symbols, you will have the chance to play a mini-game that can reward 10 free spins or other bountiful prizes. There is also a free spins round which can be triggered by landing 3 or more symbols with Koi fish anywhere on Hot Ink’s reels. If you are a fan of Greek Mythology then you might be surprised by the way Microgaming’s developers have decided to portrait Hades. 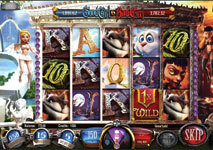 Follow the quests of the cool and fun character who is the god of the underworld in this 5-reel, 20-payline video slot. 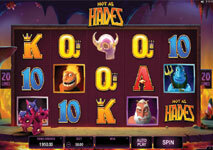 The estimated RTP of Hot as Hades is 96.75% which shows that players have good chances of sweeping great payouts. Among the highest paying symbols of the game, you will see the Greek deities Zeus, Poseidon, the Gorgon Medusa and Cerberus, the keeper of the underworld. The special Super Mode Free Spins feature in the base game can be randomly activated and will award players with 5 free spins. While this feature is activated there will be three Wilds stuck on the reels which can lead to amazing wins. If players are extremely lucky, they can land a fourth wild symbol. The truly interesting bonus feature of Hot as Hades is the Quest for the Crystal Helmet. It can be triggered by landing three or more Crystal Helm Scatters anywhere on the reels. This will activate several mini-games that players must pass. There are four levels to the Quest for the Crystal Helmet and the characters of Cerberus, Medusa, Poseidon and Zeus represent each one of them. Passing each level will grant you a prize, however, choosing a “Block” symbol will end the mini-game. If you are lucky enough to pass all of the four levels of this quest and you find the Crystal Helmet at the final stage, you will be rewarded the grand prize of Hot as Hades. Thanks to NetEnt’s Dead or Alive slot, players can go back to the 20th century of the Wild West and dive into rewarding and thrilling spinning adventures. This 5-reel video slot has 9 paylines and has an estimated RTP of 96.8%. While some may be disappointed by the fact that there are only 9 paylines, the bonus feature of the game can be quite rewarding. The great graphics and Wild West theme make the slot a wonderful way to rack up great payouts. Among the high-value symbols of the game, you will see shot glasses, cowboy boots, a cowboy hat, a holster with a pistol in it and a golden sheriff badge which is the highest-paying icon. The rest of the symbols with lower values are represented by the standard playing cards 10, J, Q, K and Ace. In the base game, there is also a Wild symbol that can replace any other icon in the game, except for the Scatter. While players play with free spins, there are Wilds that are stuck on the reels and can help players hit winning combinations. If there are 3 or more Scatters anywhere on the reels, this will trigger 12 free spins. While this bonus feature is active, every win will be doubled. There are 5 different Wilds in the bonus game and each one of them will stick once it appears on a reel. If you happen to land Sticky Wilds across all 5 reels, you will receive 5 additional free spin rounds. There is only one opportunity to retrigger free spins while playing the bonus game. Visually appealing and quite original in theme and design, Da Vinci’s Vault is an interesting video slot that pays homage to one of the greatest artists and inventors of all time, Leonardo Da Vinci, of course. The Renaissance-inspired look blends perfectly with the dark, mysterious imagery and the moving cogs and gears that can be seen in the top corners of the screen. The return-to-player here is 94.04%. The game was created by Playtech, one of the largest casino and gaming software developers right now, so you can expect it to be made with lots of imagination and attention to detail. And indeed, the slot is quite innovative and original, at least in its appearance. When it comes to the gameplay, it is rather standard, which would appeal to most slot players – it comes with 50 reels, 20 fixed pay lines, and bets from $0.20 to $100 per spin. Symbols include goblets, flying machines, as well as images of the Vitruvian Man and of Mona Lisa. Both Wilds (a gold energy image) and Scatters (a compass coin) offer separate payouts. The Free Spins feature, however, is triggered by a third symbol, the cryptex, which needs to appear on reels 1, 3, and 5 simultaneously. The free spins are infinite and can be stopped only after the special skull symbol lands three times on the reels. If it appears on the middle reel, however, it turns a random symbol into a wild for the rest of the free spins. In addition, players can try out the High-Roller feature, in which they are given 5 spins and can collect seals to trigger one of the three vault wheels. Software supplier Playtech has unveiled one of the online slots with the highest return percentages ever. The game in question is called Ocean Princess, has a theoretical return percentage of 99.07%, and is the perfect option for players who are into classic slots. This mermaid-themed game plays over 3 reels, 5 rows, and 5 paylines. The slot accepts between one and five coins (of up to $5) per spin but we recommend you bet the maximum if you are aiming for the biggest prize – players who dive into the ocean depths with this mermaid princess have a chance to collect a maximum payout of 1,000 coins. Respectively, if you venture to risk the maximum bet of five $5 coins, you pocket a mouth-watering fixed jackpot of up to $25,000. Ocean Princess may be a classic slot but this has not prevented Playtech’s software specialists from equipping the game with a wild symbol. Look out for the jeweled crown – not only do three crowns on the same payline award the jackpot but they can substitute other symbols, which results in more winning combos for you. This is a multi-spin slot with a hold feature that enables you to fix one or more of the reels in position so that they do not rotate on the next spin. 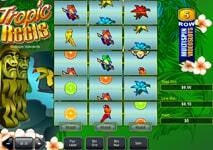 Tropic Reels is another title from Playtech’s selection of classic slots. This colorful game will undoubtedly appeal to the taste of 3-reel aficionados looking to score good profits. The game uses a 3×5-reel grid and has a long-term player return percentage of 98.85% which makes it one of the best-paying slots you can possibly hope to find online. The name pretty much suggests what the theme of this slot is. Players will find themselves amid a tropical jungle where various beasts assist them in scoring high-paying combinations. Some of the highest prizes you can pocket are 200 coins for three red parrots, 150 coins for three yellow parrots, and 100 coins for three blue ones. Scoring three identical citrus fruits can earn you anywhere between 25 and 75 coins per payline. The most important symbol in Tropic Reels is the wild tiger that substitutes for other icons and holds the key to the fixed jackpot of 2,500 coins. The jackpot is awarded only for winning maximum bets of 5 coins. Similarly to other games from the Playtech classic collection, Tropic Reels has a hold functionality, allowing to keep one or more reels in position while the other one(s) rotate on the next spin. Software developer Thunderkick takes players on a thrilling adventure toward uncharted territories with its 2014 release 1429 Uncharted Seas. This is a 5-reel slot with 3 rows and 25 fixed paylines that boasts a sea-faring theme and a host of beneficial features including free spins, scatters, and expanding wilds. The reels spin over a piece of candle-lit parchment that contains a map leading players to the hidden treasures of the high seas. Speaking of treasures, you can really expect to pocket a little something from this game since it comes with a rather high theoretical return of 98.60%. The slot is playable from as little as $0.10 but bets per spin can escalate to $100, rendering 1429 Uncharted Seas the perfect game for low and high rollers alike. The high-paying symbols are all theme-related featuring various mythical creatures like mermaids along with giant lobsters, squids, and turtles. These are complemented by low-payers like the star, sun, and crescent moon symbols. The game awards up to 50 free spins for landing three or more scattered compass symbols on the reels. Players will also benefit from an expanding wild ship that extends to cover entire reels when being a part of a winning combination on reels, 2, 3, and 4. The fixed jackpot of 50x your overall stake is paid out to the player who lands five mermaid symbols on a winning line. Most reel spinners have probably observed there is a tendency of classic 3-reel games offering some of the highest return percentages a player can possibly hope for. Microgaming’s creation Break da Bank is not an exception to this rule giving back 98% of players’ overall wagers in the long term. This 3-reel game may not appeal to the tastes of all spinners but if you are into old-school Microgaming slots, you are guaranteed to have a blast with Break da Bank. Microgaming’s software experts have stayed in line with the game’s bank robbery theme, crafting various theme-related symbols like the dollar sign alongside single, double and triple bars. The slot features 5 adjustable paylines, with players having the option to wager between one and five coins per spin. Coin denominations range between $1 and $25 at most online casinos, for a maximum bet of $125 per round. Spinners will also benefit from an atypical (for a classic slot) wild multiplier symbol containing a bank vault. Those who manage to unlock the heavy vault door with three wilds on the fifth payline and a maximum bet will collect the top prize of 2,400 coins. The wild symbols can also multiply your line wins up to 4x. Now this is a game that shines in the graphics department, which is anything but surprising since At the Copa comes straight from the portfolio of supplier Betsoft. The latter is generally known for designing superior 3D slots with cinematic features that leave you wondering whether you are playing an online slot or are watching an animated movie. Not surprisingly, At the Copa fits into this description very well. Players who choose this Latin-dance-themed slot can win on 30 adjustable paylines, 5 reels, and 3 rows. The design is spectacular, with the reels spinning on top of a brightly lit dance floor which complements the atmosphere of the game. An elegantly dress female dancer stands to the side and cheers players on as they spin the reels. All symbols Betsoft’s game designers have picked are relevant to the game in one way or another. There are trumpets, maracas, Congo drums, delicious cocktails, flamingos, and chili peppers alongside the highest payers, represented by the female and the two suave male dancers. The game holds a great appeal thanks to its three-tiered progressive jackpot, with spinners having the opportunity of winning the Suave, Mediane, or Caliente prizes upon landing five chili peppers on the reels. There is also a bonus feature that gets unlocked when the two male dancers land on each side of the female dancer. 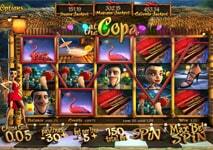 At the Copa also features a round of free spins with multipliers ranging from 2x to 10x the line win. The wild ocean symbol expands to cover the entire center reel and awards one free respin. This Betsoft creation is a must-try for all fans of 3D slot games, looking for huge winning opportunities and a high return percentage of 97.42%. Asgardian Stones is a stunning video slot from NetEnt, which is played on 5 reels and 20 fixed pay lines. It comes with an appealing Norse mythology theme, great aesthetics, and an attractive return-to-player of 96.31%. What’s even more fascinating is that the game launched in 2018 and it runs smoothly on both desktop and mobile devices. Players can bet up to 10 coins in values from $0.01 to $1.00 in free play or real money mode. The game boasts an impressive performance and instant interaction with the user, something we would all expect from a new NetEnt video slot. When looking at Asgardian Stones, however, we can see the best thing about it is definitely its design – apart from the beautiful Nordic imagery, the slot comes with amazing avalanche reels. When you hit a winning combo, the symbols in it explode, giving way to new symbols that fall in their place for a potential new winning. In addition, the game has an exciting Colossal Feature, in which the symbols can appear as larger symbols and with their weight, destroy a row of regular symbols on the reels for really attractive prizes and multipliers. When it comes to the special symbols, there are only two, a Wild and Bonus symbols that are more than enough. When the big Bonus Wheel symbol appears, it gives you either free spins or cash prizes.